A quick recap from where I left off in Part I: starting with all of the business ability of a dried plum, I developed an unpopular Twitter tool called TweetingMachine; after nine months, I was ready to scrap in its entirety and mark the whole sorry app as a failed experiment; just before I gave up, a friend pointed me towards ThemeForest, and suggested a couple of themes. I bought the themes, and sat down to integrate them. I was expecting this to take a lot longer than it did: in the end, it took me a few hours over the course of the evening. Bedtime was approaching, and I chose to spend the last hour of the night harassing my ever-patient fiancée with over-enthusiastic demonstrations of TweetingMachine’s new-found greatness. You see, over the past few months, my hatred for TweetingMachine had built up day by day, its cheery colours and shiny logo only heightening my sense of failure. Thankfully, integrating the themes gave me a new burst of enthusiasm for the project. Suddenly, I was really enjoying visiting the site and playing with the tool. As I woke up the next day, my head filled with all-to-ambitious dreams of wealth and success, and this in turn motivated me to develop yet more features. I’ll leave the precise date I put the new designs live as an exercise for the reader. So, cue wild happiness! But how well did this translate into sales? One month, and only five new subscriptions. At this point, I was charging $9.99/month, with a free trial of 24 hours. I thought this was a fair deal, but as the stagnating number of new subscriptions showed, something wasn’t working. What could it be? And why? Of course! The price! That MUST be where I’m going wrong! Halfway through November, I bit the bullet and made a significant change to the pricing: TweetingMachine now cost $19.99 per year; no more monthly rebills. I have yet to have any magic moments with changes I’ve made to TweetingMachine. By that I mean changes that have had an instant effect on use or payment. The pricing change was no exception… for the first 2 days. It was now the middle of November. And on the 15th, someone subscribed. On the 16th, another user paid. Teasingly, no-one signed up on the 17th… but on the 18th I received two new subscriptions. The pattern continued for the rest of the month, averaging one sale per day. Well! This was MUCH more like it! November brought in over $200! December 2010: What was that about marketing? The rate of new subscriptions continued throughout December, sometimes two subscriptions a day, and on one memorable day, five users subscribed! So now the concept’s proved, how can I get more potential users to visit the site? I took the view that if in doubt – as I was and continue to be; note earlier implied reference to business ability of a squashed frog – follow what your competitors are doing. So, I sat down, typed my competitors’ names into Google, went through page after page of links, and identified bloggers who might be interested in covering TweetingMachine. I sent hundreds of personalised emails, and received under ten reviews in total. Oh well, better than a kick in the teeth. I also found lots of directories of Twitter tools: type in a description; upload screenshots; get listed; lots of happy users dance their merry way towards your site. I was expecting new subscriptions to tail off just before Christmas; it made sense to me that there might not be that many people online, and even fewer ready to hand over their hard-earned cash after the yuletide spending craziness. Imagine my happiness when new subscriptions continued, including on Christmas day itself! December brought in just under $500 – to be precise, $479.71 after PayPal fees. Whilst I was happy with January’s takings – $429.75 after fees – the new signups permanently tailed off at the end of the month. Something was definitely amiss. I had started a new job in January, developing Facebook applications for a local startup, and this was taking up an awful lot of my evening time. I had some ideas for changes to make to TweetingMachine that I was keen to implement, but wasn’t sure when I’d get around to it. After all, assuming that my time is free, each month it still bought in the equivalent of a few nice meals out. Still, subscriptions had nearly stopped coming in altogether; for reasons unknown, TweetingMachine had six people in total subscribe in February. I had strangely depressing thought: if I had been lucky in December and January, quite how much money were those who knew what they were doing making? I eventually found the spare time, and made a couple of small, but effective changes: I increased coded some flexibility into prices, so future price changes would take seconds to implement; and I did the same for the free trial period. 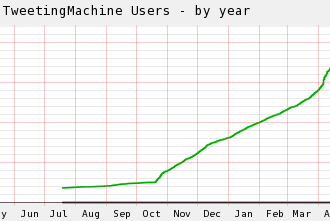 Going forwards, TweetingMachine cost $19.99/month, and the free trial increased from 24 hours to 10 days. What difference did increasing the price 12-fold make? Colour me shocked, surprised and, frankly, happy: it made *zero* difference! Actually, I tell a lie; the rate was between that of January and February. Essentially the same… except that these subscriptions were going to be rebilled each and every month! I was starting to feel cautiously optimistic. There were still plenty of outstanding questions (such as: how do I get MORE MORE MORE users to visit? ), but for now my most pressing question was: will these subscribers continue their subscriptions next month? April 2011: The answer is… yes! Going forwards, there are a few tasks I need to get on top of. Number one on my list is to get into A/B testing. I’d always dismissed this due to: a) laziness and b) incompetence. Well OK, since I’m being honest here, also c) I thought that I didn’t get enough traffic to be able to draw any meaningful conclusions. I believe that TweetingMachine now receives enough traffic to warrant proper testing, and I’ll be sure to write an update post about how I get on. Now, this isn’t a story of huge, wild success; it’s of a 29-year-old making his first steps in business. I believe that in a few more years, after a few more failures, and a few more, modest, successes, I’ll be in a pretty good place for my first major success. The point is: you have to make a start. The technology I use for my projects, and why. How I integrate themes from ThemeForest into my apps. My other projects, including FasterDev and InboxCleaner. How I made a reasonable living freelancing on sites such as vWorker (previously known as RentACoder). Good to read the second post. After reading part way through it, I was going to comment saying you should do A/B testing, but then saw at the end of the post that you said you will. I agree you need sufficient data to make that testing meaninful. @Vasudev Ram, “I was going to comment saying you should do A/B testing…”. That seems a bit premature with such little traffic. I would suggest it is much more important at this stage to get feedback from the 20/30 subscribers. Try to get them on the phone or on skype and talk to them, spend an hour or two each week doing that and you’ll probably get far more valuable insights. @warp: You’re right. I should have stated it more clearly. I _did_ remember that his traffic was probably too low (right now, anyway) for A/B testing, but also did not remember the precise number, and was feeling a little tired so did not go back and check and then reword my comment with a qualification to that effect. However, I did note (and, before submitting my comment, went back up to his post content, to confirm) that he had himself mentioned the point about not to do A/B testing with low traffic, so overall, that’s why I did not qualify my statement. Also note the last line of my comment. Anyway, your alternative suggestions are good. Congratulations on working your way toward having a great passive income. Look forward to hearing updates in the future. Well done! Not exactly $500 a month, but you’re well on your way, right? It’s pretty admirable with what you’ve done and it’s something I am slowly working on (full time work is pretty draining on the energy) and you’re an inspiration for all of us creating sustainable businesses. When I read the first part and the comments on HN where someone said $500 wasn’t much and you replied it was not bad in Poland, I assumed you were Polish. That made me want to read the second part even more as I’m Polish (living in London). Now I know you’re a British guy living in Warsaw and I’m even more interested. You’ve mentioned you want to do some A/B testing. I’m launching an A/B testing app next week, but can give you access to the beta version if you want. I’ll give you free unlimited access for as long as you want to use it (even when it’s gone live). Let me know via email if you’re interested. I’m looking forward to talking about a Brit living in Poland, a Pole living in England but mostly looking forward to talking about web development and side-projects. Kudos to you Tom, and thanks for sharing. You’re an inspiration. What I’d like to read? An update 12 months from now. Congrats Tom on your business! I was wondering how do you solve the issue of existing clients when you change the price and the subscription period. Do you retain the same rules for “old” clients as when they were signing up? That sounds like a lot of work to maintain everything, except if you build that in from the beginning on. Probably the wrong way. Customers stay on the plan they’re on, so the lucky subscribers who are on $20/year stay on $20/year until they cancel their subscription. I think that’s actually the right way to change your prices. Makes for happy customers. Navigate to http://tweetingmachine.com/ and in the middle of the screen is reads “The Ultimate Twitter & Facebook Tool – TweetingMachine – only $19.99/month” , just like ythefoe says. I definitely find a lot of comfort in your 2 posts on this topic. I am a little reluctant to just off and try this instead of my known paths. Your posts have renewed my excitement and I think I will be giving Android development a try when I get my new smartphone. Well, the more I read from you (granted, it’s only this and part I), the more I feel inspired. ++demand for “How I made a reasonable living freelancing on sites such as vWorker”. Your sense of humor mixed with bare honesty (showing all the income and stats) makes these series a total joy to read. I imagine traffic to your service is up as well and hope it is translating to subscriptions for you. Ah I was hoping you’d post part two soon! I’m working on my first ever solo project and reading about your ups and downs provides a unique look into that world. Thank you! I’m officially addicted to reading your stories. I just signed up for the trial, and I’m going to explore your different features. One thing I think you need (and I’m sure you’ve thought of this), when I schedule a tweet, it’d be nice to have a Calendar popup instead of requiring me to type in the date and time. I’ve really enjoyed these articles, particularly the really down-to-earth style, thanks for taking the time to write about your experiences. I’m launching a site myself soon too (sendcat.com) and I was interested in how the bloggers section and offer was working out for you, is that something you would recommend doing? Do you get many subscriptions that way? Congratulations Tom! Your blog is fun to read. How did you come-up with the price? I would like to read all those soon to be posts, especially the freelance one. I’ve been freelancing this year and find it quite boring. The whole working by yourself, all alone part. How did you meet your fiancee? Thanks for your story. It encourages and validates my own efforts. Truly thanks and good luck in growing further. Keep it up, man. Best of luck! Interesting article. Thank you for sharing your experience. Nice article. I would love to read your post on the technologies you use and why. Also, please consider styling up the email subscription section a bit. It looks out of place in a blog which has, otherwise, been styled well. I’m glad to read you’re having fun playing with your app. Thanks. In return, proofreading: the green button at the bottom has a typo – there’s a missing ‘s’ . I’d also like to hear about the tech end of the development and why. Also, would like to know how you found the templates to work with? I’ve longed looked at themes but thought they would be a real pain to contend with. What technologies were used to build this webapp? Thank you. Look at what is happening with people who write books for online distribution? They change 20 bucks and no one buys it. They charn 1.99 and all of a sudden a huge number of readers appear and they start making big profit. Have you considered going the cheap monthly route? .99 a month? Or is administrative costs going to screw that? People may see that and given what they can get for it, just sign up. Now that seems like you are going to lose money but what if daily you have 50 new subscriptions? I don’t know this for sure, just giving you an idea..
You got $10/month for selling that sh*t? One wonders why people complain about not having enough money in today’s consumerist society. Hi Tom, great write-up! Very interesting, informative, and inspirational. I also have a subscription based product I’m looking to get going (for teaching Spanish), and I’m in the process of researching recurring billing options/providers. I’m currently using Amazon Payments, but they seem to make recurring billing a bit difficult. Do you mind sharing who you use for your recurring billing and if you’re happy with them? NICE Job, and nice story. I’m glad you’ve carved out a niche. I read through the comments, and I’m surprised no one else is mentioning the competition (IE Tweetdeck ad infinitum). I know there are a lot of tools. I may be naive but I’d suggest more and more features even though you have some great ones.. It’s not a criticism, but I’d say that I’d truly want a ultimate app if I”m going to spend money on something like this, although I do realize you’re just one person. Also, I’d suggest a short term access plan or a real cheap monthly option. I think that I would be more inclined to buy a month for 2.50 than a years subscription as I think a lot of gen x gen y people will use something like twitter for a while and then get bored with it, and tend to be a little non-committal. Congrats are in order however. I wonder if your subscriptions have increased since you did these two posts, especially since they were both on the front page of HN…? I’m curious which paypal products you are using, and how they’re working out for you? I’m really enjoying these posts! Right now, I’m struggling with adding subscription billing to an app, and I’d love to hear more about how you manage payments and plans and integrate them with your app. Thank you for writing these up, I really enjoyed them. I’m hoping to someday soon have my own first steps into business so these stories and lessons are very interesting for me, thanks for taking the time out to write them up! I look forward to your writeup on your experiences as a freelancer! I would be interesting in hearing something about the architecture you are using. What about a part 3? Awesome! I really appreciate you sharing this inspirational account of whatever you went through. I m myself going through the inception phase of a lot of different ideas. I have been waiting for this post, since I saw ur first one on HN. Could you please share, what has been the biggest hurdle in executing the changes, you thought would bring you millions? $19.99/month is too much for the service you’re offering. People usually don’t experiment going from $19.99/year to $19.99/month. That’s a huge difference. There are free scripts which do something of you stuff. On a side note, unfollowing someone just because they unfollowed you is a silly kid behavior. I follow someone because I am interested in what they say. Has no bearing whether they follow me or not. Please read the post again; if the price is too high then no-one will would pay, which is clearly not the case. Regarding unfollowing, it’s a feature that was repeatedly requested, and on which I receive a lot of feedback, so I don’t really understand where I’m going wrong. If the price is too high, people wont buy it, simple. But there is something to be said about charing a ‘lot’ for something, it makes people value it a lot more, adds prestige, (is a Land Rover really worth £70-100K, or is it a prestige thing, I can buy a Corsa for £7K that does mostly the same thing). Also, it makes it worth while given the number of subscriptions, my first website (www.vinyldye.co.uk) charges quite a lot for what people can get from ebay cheaper, yet people still buy it, and it makes it worth while running the website. (it also helps being at the top of Google for the search term Vinyl Dye !) When we sold it much cheaper, we had the SAME number of sales, go figure! Do you think offering a free trial period is a good, customer attractive thing or anyone needs your product would sign up anyway even if there is no free trial period but a good demonstration of the service via a video on the index page, reviews from bloggers, etc. ? How many people using free trial period have upgraded for paid membership and how are you currently handling the people who haven’t upgraded to the paid membership(I mean how long are your retaining their data on the system in case of they will come back for some time in the future) ? I also want to ask do you own a company for getting payments from people by offering this service ? I didn’ t see any company name on the site. I’ m asking this because I’ m considering building a service whose revenue model is going to be based on paid membership. My third and last question is how are you gathering user feedback ? Is there some internal section to reporting issues, feature requests, etc. or something else ? No doubt this is very interesting and very helpful especially for someone like me in the process of launching a subscription based web app. Thanks. Hi Tom, just found this post searching “selling your web app”. I’m interested to hear how things are going one year on? Thanks, man! Coming from the sysadmin/dev-ops side of things, I’ve been stuck on worrying too much about scalability and high-availability of my apps, rather than the apps themselves. I now realize that all of the effort I have expended on infrastructure has been at the opportunity cost of developing the applications that matter. It sickens me that I previously had read so many articles about applications that were trampled by sudden demand spikes and wasted time worrying about it. I’m assuming that I’ll have more of a problem actually finding enough customers to generate the traffic required to bother a single NGINX VM! Instead, I’ve wasted time configuring multiple load-balanced VMs connected to load-balanced and replicated backend databases. At least I now have that knowledge in case any of my applications ever need that level of scaling. Still, I could have been making money rather than worrying! Is this what they call analysis-paralysis? Thanks for this article! Your article made me feel more confident as a developer, because I am reminded that being successful does not come without obstacles. Even the most experienced ones must work through a lot. It also is very helpful, because you tell of specific experiences that many of us newbies have to face, so we know heads-up how being a developer is like. This will definitely ease our experiences. I much appreciate it.